Wishing you all a Happy New Year | Is This Mutton? So here it is, my last post for 2017. 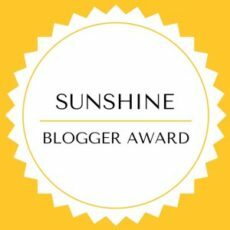 I've got a lot to tell you so it may be a long post! First, Christmas. 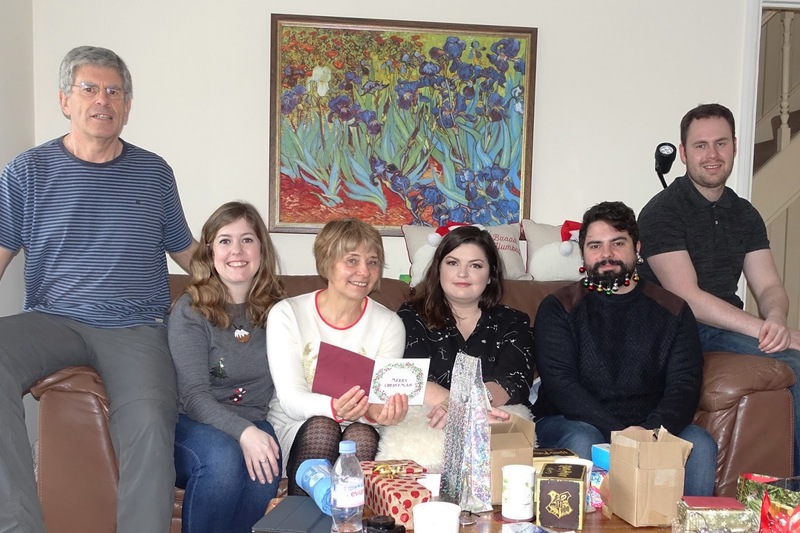 On December 23 we took John's grown-up children and their partners to a Christmas Carol singalong at the Royal Albert Hall, followed by lunch. If you live in or near London, I'd highly recommend the Raymond Gubbay Christmas series. The carol concerts are really magical. 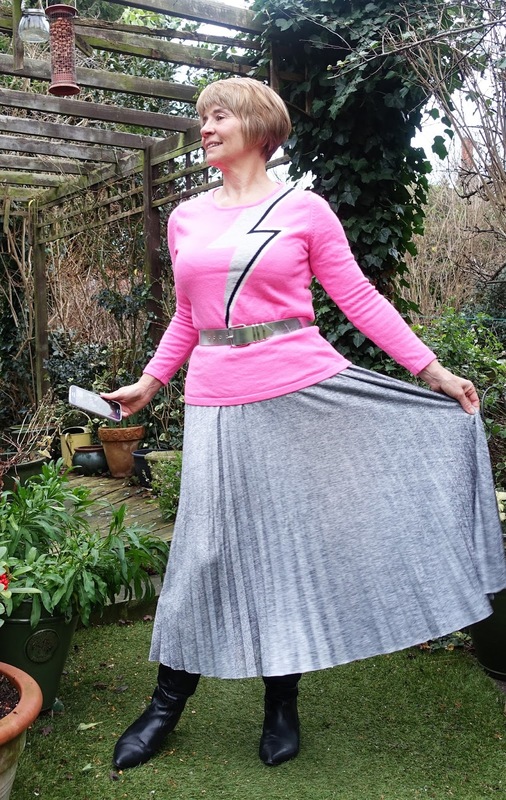 I wore my pink Bowie jumper, silver belt and a long pleated silver skirt, originally from Warehouse which I acquired on eBay. I would have worn my fabulous new silver shoes but Mr Mutton tends to walk at quite a pace when we're out, and I can't keep up in heels. So flat black boots it was. On Christmas Day the children were going to Nan's so called at our place on the way for presents and a quick game of Silly Sausage. On Boxing Day we had five guests -John's lovely first wife Lynn, his sister Kate and her husband Neil and daughter Rachel and fiance Sean. With a lot of help from Marks and Spencer I served up cold meats and salads, jacket potatoes, mini quiches and sausage plait. Then we played games all afternoon. This is what I love about Christmas - it's the only time families truly come together without the TV or phones getting in the way. Tonight we're out for an evening of games at John's brother Eamon's house with more of the extended family. I'm wearing this cute plaid skirt which I picked up half price at Sainsbury's, along with the drop earrings (just £3!). The jumper was a TU at Sainsbury's buy last winter. Sainsbury's are very good for skirts but sizes 10 and 12 sell out very quickly. During their sale, you can sometimes pick up these sizes because they've been put back on the rails after being returned. The other outfit featured - silver pleather pencil skirt and Iris blue velvet top from Kettlewell Colours - is maybe what I would wear if we were going out on New Year's Eve. We're not --- to be honest I see no pleasure in crowded pubs or restaurants on New Year's Eve, full of people getting progressively more drunk. OK if you're a youngster out on the pull but Mr Mutton and I am quite happy in front of Game of Thrones (we've saved Ned Stark's death for tomorrow!) with a bottle of champagne. I must show you Mr Mutton's latest acquisition, an electric garage door (above). He told me it would be great for my shoots, but the best time weather-wise is early morning, so the rest of the pictures were taken outside neighbours' more shabby garage doors! On New Year's Day, we'll be having roast beef and I'll take down the Christmas decorations. I don't make any resolutions. January is a horrendous enough month without deprivation and the disappointment of resolutions made and failed after two weeks. I won't be posting quite as often in 2018. Two reasons. One is time. I feel a bit of a fraud for saying I don't have much time because what woman does? But two things have happened which have put huge pressure on my time. Three months ago I started a new job, quite a challenge after 20 happy years at my previous company where I worked mostly from home. I now have a car commute that takes about an hour and fifteen minutes each way, four days a week (one day working at home). So there isn't much time in the evenings except for a couple of quick gym sessions. We're undertaking a big challenge in May, the Wainwright Coast to Coast walk. This is 200 miles from St Bee's in Cumbria to Robin Hood's Bay in North Yorkshire, over 15 days. On some days we will be walking 18 to 20 miles. On our normal visits to the Lake District we walk around 10 miles max (usually less if I have my way) so I'm under no illusion that I need to put the training in. I'm going to do a short walk at work most lunchtimes, and on Saturdays I'll be joining the Meetup group of Outdooraholics who meet at train stations and go on great long walks full of interest, lasting most of the day. 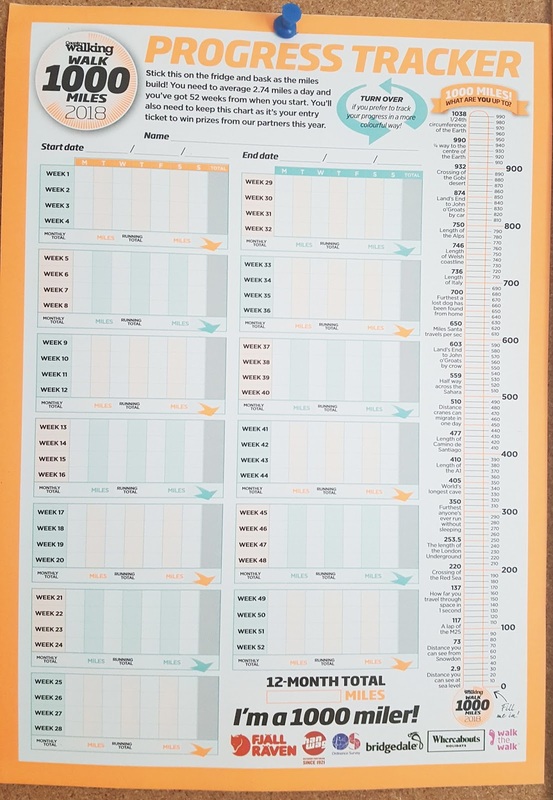 I'm also going to attempt the Country Walking magazine #Walk1000Miles, where you log every walk in a progress chart and become a "badger" as you collect your milestone badge. There's a group on Facebook and many friendships have been forged with people getting together for walks. My progress chart is pinned up in the office ready to be filled in! If you want to join in, Country Walking magazine February issue (on sale Jan 7) has the progress chart and a booklet full of inspiring case studies from people who transformed their health or weight last year. So as you can see, I won't have much time except on Sundays when I usually cook lunch for family, go to the gym, catch up with housework and flake out listening to Johnnie Walker's Sounds of the 70s. The fashion shoots will be fewer because it's quite a faff ordering clothes, photographing them and organising sending them back. I'm not a well established enough blogger to have many brand collaborations where I get sent clothes (I wish!) and to be brutally honest, I don't need to buy any more clothes, except perhaps a few base layers and fleeces for the May walk. But I love writing the posts and seeing your comments, so I'll still be as active as I can with the occasional fashion post and regular posts on jewellery and beauty. So whatever you do on New Year's Eve, have fun and I'll see you in January - there's a post ready on the birthstone for January, the garnet. Wishing you all a healthy, happy and peaceful New Year. Silver pencil pleather skirt, Next; Iris Asos Shiraz pointed heels, reduced to £21, Asos; velvet faux wrap top, reduced to £34.30, Kettlewell. Silver dolly bag, very old! Pink Bowie jumper, The-Bias-Cut.com (sold out in pink but still available in Navy); silver pleated skirt, Warehouse (old). 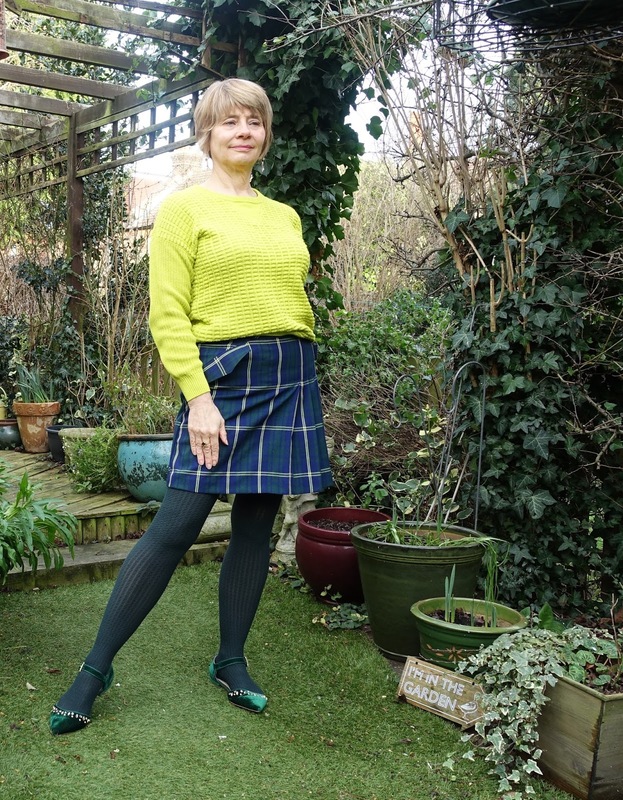 Plaid mini skirt, TU at Sainsburys, now half price; drop earrings, £3, Sainsburys, green velvet shoes, Next, old. Great post Gail! I think it is so fun when we take the time at the new year to reevaluate! I am cutting way back on clothes budget. I have a well curated closet now and really don't need more! Health and fitness are high on my list of to dos this year! Have a happy new year! Yes, I did wonder when you got the new job how you'd find the time! But job must come first and family and Mr Mutton! That's interesting that you send the clothes back - I'm just about to do the same thing and it is a faff. I bought something on the 'net and the colour is just not right. Hope I can as it was a sale item. Can I say those silver shoes and the green ones that go with your plaid skirt - just lovely, both of them. Well, Happy New Year, Gail! Do do the occasional post - I'll be pleased to see you!! Take care and all the best for 2018! Thanks Penny for all your visits and kind comments. It's readers like you who make it all worthwhile. I do feel guilty when I photograph clothes and send them back, but I was often paying for the return and I figured they got some advertising out of it. I did end up buying at least 1 thing each time so it soon mounts up! Happy New Year to you! What a busy time you've had! I have yet to hear of one person who is out partying on NYE. We used to do a villa party if we've been away with friends but we haven't been away for NYE for 5years and to be honest, I always feel uncomfortable with the celebrations, always have done. I heard of the walk challenge recently, 3 miles a day doesn't sound much but the rainy blustery days means there are days when you have to double or treble to catch up and I have a big issue with hobbies that take up too much of the day. I guess for me it's best to do the daily quota when the weather allows and not focus on an end goal. Does that sound like a cop out?! I couldn't be bothered with all that returning malarkey so can understand why you want to stop that,I had no idea that went on behind the scenes! Wishing you and hubby a very Happy New Year, filled with challenges and changes. Hugs, x. So you are GOT binging, eh? Good choice. You know, I have never watched the Red Wedding, go to the part when they closed the doors and turned it off and picked up the next episode. I will certainly appreciated when you do post next year because I so enjoy them. When it comes to hiking, you are certainly one of my inspirations. Have a great New Year Gail-see you in 2018. We'll all be gutted when GOT is finished for good! What a magnificent series. I'm afraid to say, I have seen the red wedding episode! I'm so happy that you visit and read the blog Teresa. All the very best for 2018. Hubs is a GOT fan but me, not. What is silly sausage? I must ask you end Jan.
Gail, walking is no excuse! Surely you can type and walk. Or dictate and walk and walk 5 miles in heels (a post there - walk 5 miles in my heels, haha). I haven't got into the order and send back business. My posts are based around my existing wardrobe and outings. It's the only way time allows me to do this. I wish you huge luck and stamina in all you do in 2018. I'll bring the silly sausage with me. It's such fun. We're having a tournament at work after someone had it as their secret Santa. I'm going to give the existing wardrobe approach a try. A year ago I didn't have a very extensive wardrobe but I do now. All the best to you for 2018. Lovely post Gail, I am loving your outfits :) Happy New Year. Thanks Claire and Happy New Year to you too! What a fabulous time with family, Gail! And a great goal for the walk!! Thanks Jodie and all the best to you and your family for 2018! Gail, first of all, your outfits here are all so fabulous! The shoes! The shoes! The silver ones. The green ones. Oh, how my eyes lit up! I certainly do love your style and I will miss seeing as much of it in the new year. But it does look like you have lots of exciting things on the horizon, so for that, I am very happy for you! 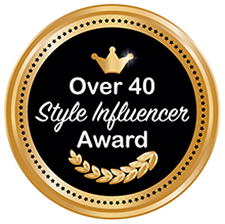 Thanks so much for linking up with me. Wishing you the best in the new year! I do love a patterned skirt!